When I was but a wee lass, nestled easily and comfortably in East Tennessee, my dad traveled frequently. As in Sunday-Friday of every week, frequently. Friday night was my favorite bedtime because I knew if he wasn’t home by the time I got tucked in, that he would be home when I woke up, and usually he would already be awake mixing up chocolate chip pancakes. I would join him downstairs, and he’d let me whisk the batter and “help” him drop chocolate chips into the cooking pancakes. But on weekends we didn’t get pancakes, we got Dunkin Donuts. Some of my richest memories are those weekend breakfasts with my dad. We would drive to the local Dunkin, and every time, I got the exact same thing – a pink frosted with multicolored sprinkles. And we’d get a big box of assorted Munchkins with politically incorrect men marching along the exterior showing those delightful little donut holes in various stages of preparation. We’d take it all home and enjoy breakfast together as a family. Dunkin has always had the secure spot of doughnut king in my heart, and Munchkins will forever be intimately tied with those carefree days of youth. Although I haven’t feasted upon a true Dunkin Donut in years, during a particularly emotional time a few years ago, more than once I would stop into my neighborhood Dunkin and just look at those pink frosted rounds to calm my spirit. It always worked… no calories consumed but peace restored (and more than one odd look garnered). I was thinking about those little Munchkin friends last night when I set up shop to bake these bite size pumpkin treats. Doughnuts currently are to food blogs what tongues are to Miley Cyrus… omnipresent. I just couldn’t justify the purchase of a doughnut pan for such a novelty item, but I wanted what they could produce. I decided that my mini-muffin tin could serve as a sort of mold for a doughtnut hole. And holes are just more fun, amiright? I later learned that you can, in fact, purchase a dedicated doughnut hole pan to produce nice, round little bottoms (which, in my experience, is always a more preferable bottom than a flat bottom, as is the case here, well not here on the writer, but here on the finished product). I was delighted when I popped the little holes out of the pan, glazed them and arranged them on a plate to show DTH. “Now what are these again?” he asked patiently. “DOUGHNUT HOLES!” I exclaimed proudly using my outside voice (which is really my inside voice, since they are really one-in-the-same). “They look like little muffins,” he mused. Right. Because I guess when you use a muffin tin for a baked good, by default you yield, well, a muffin. EVEN STILL! These are flat bottomed doughnut holes. I started to call these treasures “Muffnuts,” but when I went to Google to make sure that term wasn’t already taken, it gave me several true baking links accompanied by several options to click on sites that I probably didn’t want to. So I’m glad I checked before I turned that word into a link leading here. Though, that may increase traffic. And what’s here may not be that disappointing, after all, because DoughMuffs (?) are delicious. Preheat oven to 350. 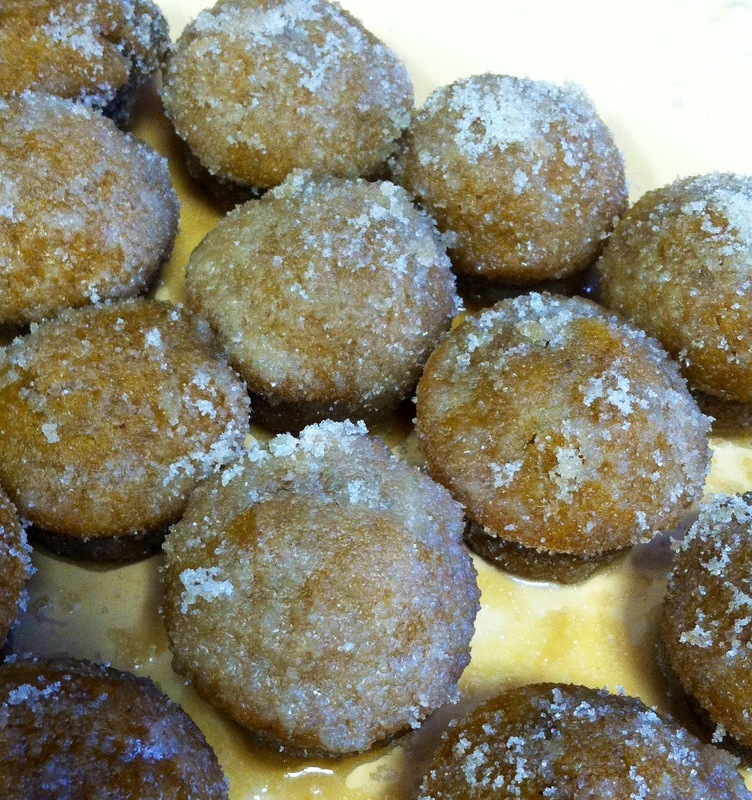 Grease or spray a mini muffin tin (or doughnut hole pan, if you’re fancy). Combine oil, brown sugar, egg, vanilla, pumpkin puree, and milk. Add dry ingredients and mix until incorporated – do not overmix. Drop by the tablespoon into muffin tin cups. Bake 15 minutes. Cool on wire rack. While doughnut holes are baking, melt butter and maple syrup together over medium-low heat. Add whiskey or bourbon and simmer until mixture thickens slightly. Combine sugar and brown sugar in a small bowl (proportion by preference. I did about 70-30 white sugar to brown sugar). When doughnut holes have cooled, roll them in the maple butter whiskey glaze then roll in sugar mixture. Or, if you’d prefer (I did both), roll holes in glaze, place back on cooling rack for a few minutes, then roll in glaze again.